The Richards benchmark is listed on speed.pypy.org as being very fast compared to CPython. 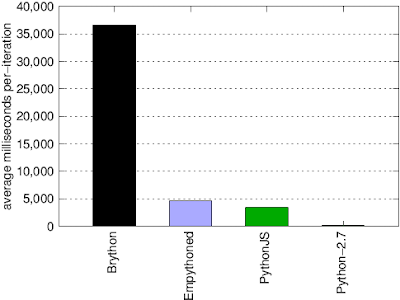 PythonJS with full optimizations beats PyPy-2.2 in the Richards benchmark. PythonJS fully optimized scores 13.9ms per-iteration, and finishes the test in 0.131 seconds. 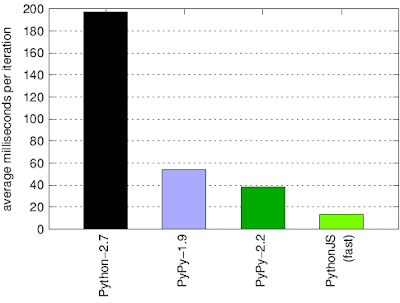 PyPy-2.2 scores 38.3ms per-iteration, and finishes the test in 0.38 seconds. (lower times are better). Brython is once again very slow, taking 36,613ms per-iteration, and completing the test in 366 seconds. 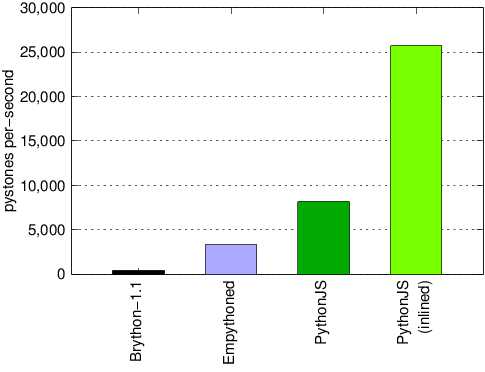 Empythoned and PythonJS (default mode) have about the same performance: Empythoned (4,590ms) and PythonJS (3,390ms). 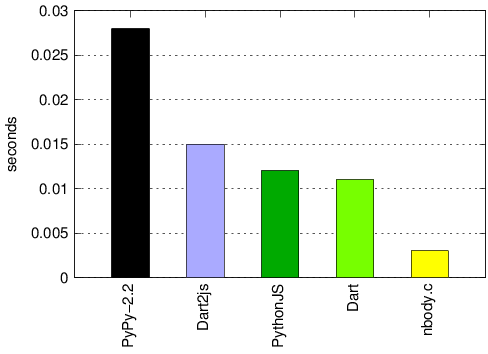 Python2.7 scores 197ms per-iteration. 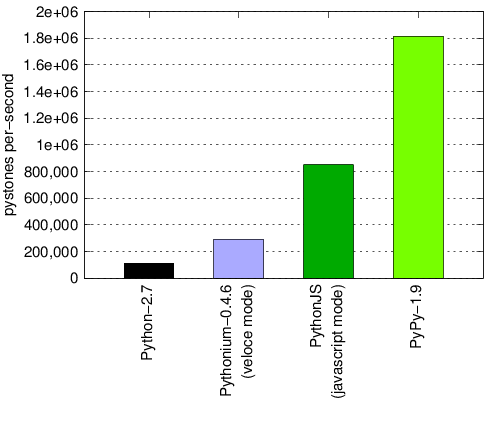 The following Pystone benchmarks were performed with the default 50,000 iterations, the results are the average of five runs. PythonJS is tested in four different modes with greater levels of optimizations. Test machine is: dual core 2.4GHZ, 4GB RAM, LinuxMint with Google-Chrome v31. I am also working on integrating Brython's tokenizer and parser into PythonJS so that PythonJS can be fully self hosted. The file in Brython's source code is py2js.js. It transforms Python code into its own abstract syntax tree that is very similar to the standard Python AST. I am making code to walk this tree and convert it into a standard AST that is required by the translator in PythonJS. See these files, and contact me if you would like to help. 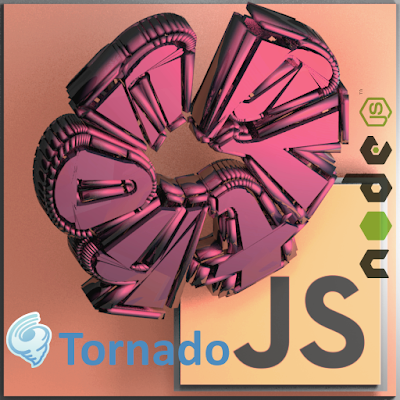 PythonJS 0.8.5, includes a new module nodejs.tornado that provides an API compatibility layer with the Tornado web framework. This allows you to very quickly port your server side code written in Python and Tornado to PythonJS and NodeJS. You can checkout the Tornado module and see a more complex example here. Whatever the future may hold for the Python interpreter, we can continue to use the language by translating scripts to run in other interpreters like NodeJS. PythonJS 0.8.4 can now translate code that is compatible with NodeJS, and includes some basic wrappers that help emulate some of Python's standard libraries like: os, sys, and io. 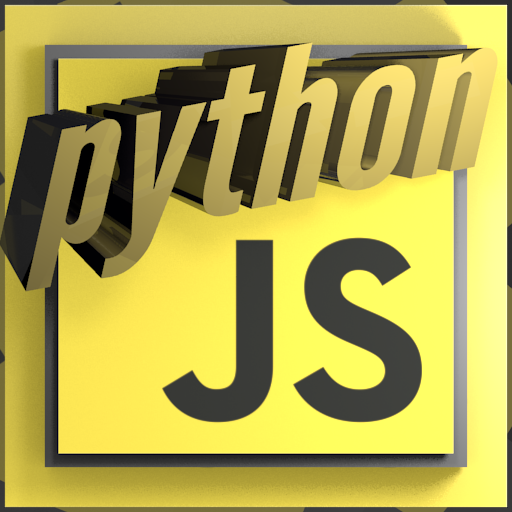 Download PythonJS 0.8.4 here. In a simple for loop over a range, with a single variable incremented: Brython is 1,000 times slower than Python, and 7,500 times slower the PythonJS. Lets examine the output of Brython to see why it is so slow. Things get worse for Brython when the loop gets more complicated, this tests increments two values. In this test Brython is 1,300 times slower than Python. Today I have released PythonJS 0.8.3, this includes the new fastdef and fast for loop optimizations. The performance test above is also included under tests/test_performance.html. 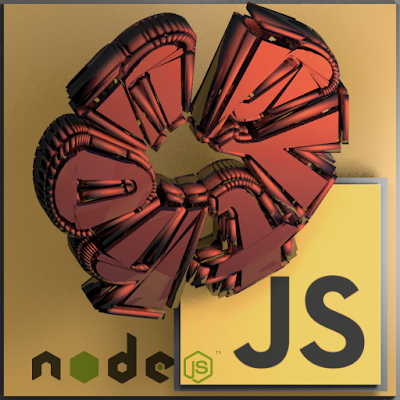 The next release of PythonJS will feature integration with NodeJS. I am currently working on a way to drive animations in Pixi.js using Tween.js and GoogleBlockly. 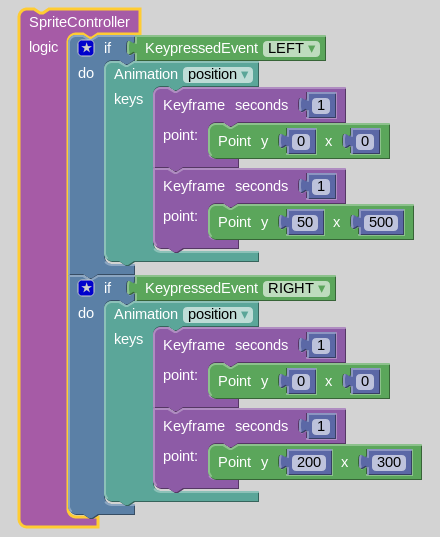 The new SpriteController Block directly parses the conditional blocks it contains, if the selected Event is True, then the animation will play. In this example the Bee moves left and right when the left and right keys are pressed. Next I will be working on improving the event system by adding more event types, branching logic, relative animation, and variables. 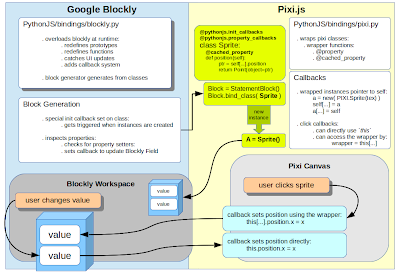 Pixi.js is a fast 2D rendering engine that is optimized for WebGL, and is able to use HTML5 Canvas as a fallback. Using WebGL Pixi is able to render high resolution graphics very quickly. The Pixi API is well designed, and easily wrapped in PythonJS, see my bindings here. Your callback will be called for every single UI event, like moving blocks, or typing in an input field. This is slow and makes it very hard to catch just the events you are interested in. You have no way to send signals back to the blocks that generated the code. This makes it impossible to update fields on Blockly's blocks, like number fields. For example, your custom block creates a Sprite, and then in the game the sprite is moved, now your code will need to update the position field on the block in Blockly's workspace, but the Sprite has no reference to the block to do so. Each time your callback is triggered, you might have to tear down and reinitialize alot of state. This is generally a bad fit for an Actor model, where entities carry out their own behaviors, and interact with their environment using dynamic rules. 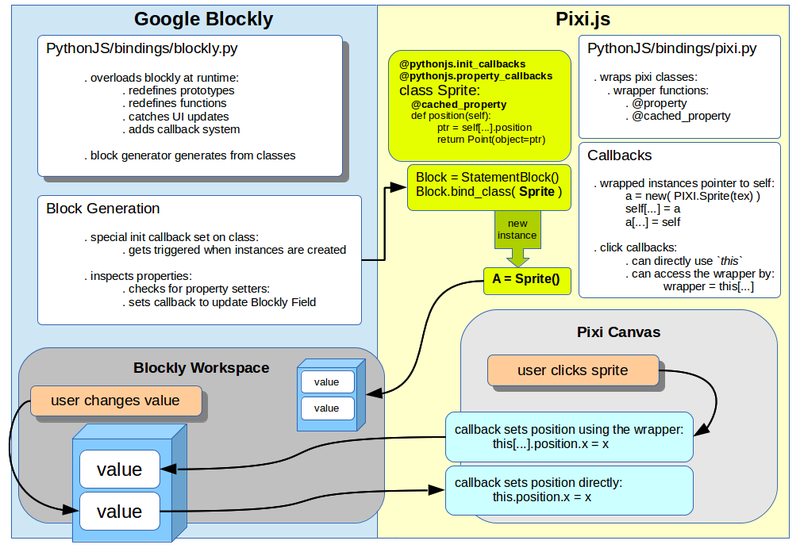 One of my goals when starting the integration between Google Blockly and Pixi was to write as little wrapper code as possible, but not so little that it was unclear how things are tied together. To achive this I implemented two special class decorators: @pythonjs.init_callbacks and @pythonjs.property_callbacks. These are different from normal Python class decorators because they inject some code and attributes into the class and it's methods at compile time. The "Block Generator" in the Blockly binding can then use the extra attributes to hook in it's own callbacks for when instances of a class are created, and when values are set on property setters. In my first attempts to integrate Blockly with Three.js I had written alot of code to generate a custom block for each Three.js class. The new Block Generator can wrap a class and generate a custom block with a single call: block.bind_class( my_class ). To run this demo you need the checkout the latest source code for: Pixi.js, GoogleBlockly, and Tween.js. Then pull the latest source for PythonJS. The source code for the demo is here.